This paper examines the factors that drive the success of multinational corporations (MNCs) in their pursuit of regional strategies. 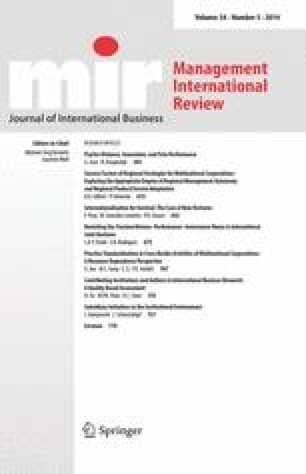 Based on contingency theory, we develop a comprehensive regional success factor model to investigate the effects of regional management autonomy and regional product/service adaptation on the regional success of MNCs. Using structural equation modelling, we also analyse the interaction effects of regional orientation and inter-regional distance. We evaluate our model by means of both primary and secondary data for Fortune Global 500 firms. Our findings show that appropriate degrees of regional management autonomy and regional product/service adaptation are highly contingent upon contextual influences on MNCs. Hoover’s. (2009). Company information. http://www.hoovers.com. Accessed 1 Sep 2009.